Our high speed electric ice crusher Rotary Switch Food Blenders YX-912 are one of our top sell Food Blenders items. With 1.5L glass big jar and coffee grinder, this Electric Food Blenders are very multi-functional. Not only can make baby food, all kinds of fruit or vegetables juicer, but also can be as the best Smoothies Maker Blender as well as coffee grind food processor. 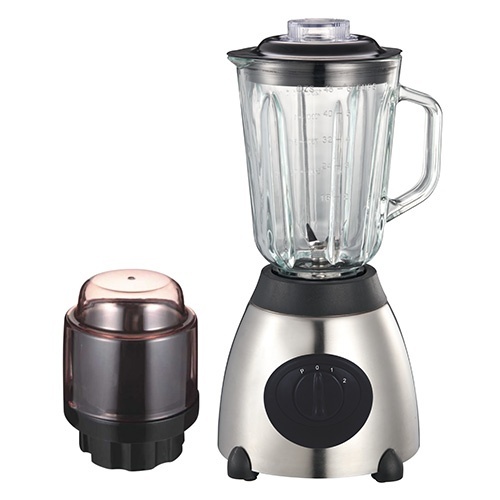 Besides, having a chromed body and anti-slip feet make this 1.5L Glass Jar Food Blenders have very elegant apperance. At last, please notice that this food blender has stainless steel big jar optional. Looking for ideal Electric Food Blenders Manufacturer & supplier ? We have a wide selection at great prices to help you get creative. All the Ice Crusher Food Blender are quality guaranteed. We are China Origin Factory of High Speed Blenders. If you have any question, please feel free to contact us.